This page explains how to update your SMAPI mod code for compatibility with SMAPI 1.9 (released alongside Stardew Valley 1.2 in April 2017) and 2.0 (released in October 2017). 1.1 What's changing and how much does it impact mods? What's changing and how much does it impact mods? 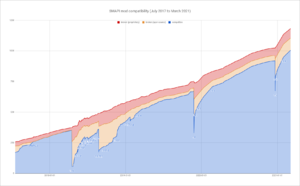 SMAPI compatibility over time. The SMAPI 2.0 release in October 2017 appears as a small bump. The last major breaking change was in SMAPI 0.40 (April 2016). Since then 23 SMAPI releases were published with almost full backwards compatibility. SMAPI has matured significantly since version 0.40, and its APIs have converged towards better consistency. Older APIs have been deprecated with full support, but this introduces significant maintenance overhead. A few rarely-used APIs were dropped in SMAPI 1.9 (when Stardew Valley 1.2 broke many mods),and SMAPI 2.0 is the release which finally drops support for these old APIs. Although this is a major change, significant effort was undertaken to minimise the impact on mods: (a) the APIs were supported for a long time with increasingly prominent warnings in the SMAPI console about their deprecation and removal; (b) dozens of pull requests were submitted to update affected mods; (c) unofficial updates were created for mods which haven't updated officially yet; and (d) the changes were actively communicated and documented to modders. This means that SMAPI 2.0 has a minimal impact on mod compatibility (see chart on the right). Optionally, you can refer to the following sections on how to replace specific interfaces. The following APIs were removed in SMAPI 1.9 and 2.0. 0.39.3 1.9¹ SObject class reimplement if needed. 0.39.3 1.9¹ Extensions.ToSingular(…) use string.Join. 1.0 1.9¹ Authour in manifest.json use Author. 1.0 1.9¹ Extensions class reimplement if needed, or use an extensions library. 1.0 1.9¹ LogWriter class use this.Monitor.Log. 1.0 1.9¹ SPlayer class use Game1.player. experimental API 1.9¹ IConfigFile and ConfigFile reimplement if needed. 1.1 1.9¹ Command.CallCommand(string) use this.Helper.ConsoleCommands. 1.1 1.9¹ Mod.Entry(ModHelper) change ModHelper to IModHelper. 1.5 1.9¹ Version class use SemanticVersion. 1.5 1.9¹ Mod.Manifest use Mod.ModManifest (changes type from Manifest to IManifest). 1.5 1.9¹ Constants.Version use Constants.ApiVersion (changes type from Version to ISemanticVersion). 1.0 2.0 Config class see mod configuration. 1.0 2.0 Mod.BaseConfigPath see mod configuration. 1.0 2.0 Mod.PathOnDisk see mod configuration or use this.Helper.DirectoryPath. 1.0 2.0 Mod.PerSaveConfigFolder use per-save JSON files instead. 1.0 2.0 Mod.PerSaveConfigPath use per-save JSON files instead. 1.0 2.0 Mod.Entry(object) see mod entry method. 1.1 2.0 Log class use the this.Monitor.Log mod method. 1.6 2.0 PlayerEvents.FarmerChanged serves no purpose. 1.6 2.0 PlayerEvents.LoadedGame use SaveEvents.AfterLoad. 1.6 2.0 TimeEvents.OnNewDay unreliable and don't do what you think; use TimeEvents.AfterDayChanged or SaveEvents.BeforeSave instead. 1.9 2.0 Command class use this.Helper.ConsoleCommands. GameEvents.LoadContent move any code into your Entry method. 1.13 2.0 GameEvents.GameLoaded move any code into your Entry method. TimeEvents.YearOfGameChanged unreliable and don't do what you think; use TimeEvents.AfterDayChanged or SaveEvents.BeforeSave instead. ¹ Stardew Valley 1.2 broke many existing mods, so SMAPI 1.9 used the opportunity to remove the most rarely-used deprecated APIs. For the latest documentation, see Modding:Modder Guide/Get Started. For the latest documentation, see Modding:Modder Guide/APIs/Config. If you use config.json, it's much easier in 1.0. Move default values into the constructor or property setters. For more information, see Modding:Modder Guide/APIs/Config. This page was last modified on 11 October 2018, at 19:30.